The MetalCloak JL Wrangler 6Pak Rear Long Travel, Compact Body, Shock (MetalcloakPatents.com) provides the longest shock travel relative to a compressed length for any off-road shock ever built in history. Period. Each shock is dyno-tested and mounting ends are pre-set for easy installation. Shocks ship with the JL-specific specs so you can be confident that your shocks are ready for your new Jeep JL Wrangler. Note: MetalCloak Recommends You Have a Suspension Specialist Align Your Jeep Once Suspension is Installed. Designed specifically for applications where space is paramount; the 6Pak compact shock body extends shafts from both sides of a floating remote reservoir/body allows for a much smaller compressed shock while still providing more extended length than ANY other bolt on shock. Just put the shock in position and bolt it in. 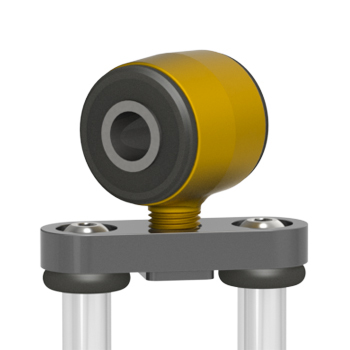 Pre-positioned rubber bushing eyes keep it in place while providing even more NVH protection.